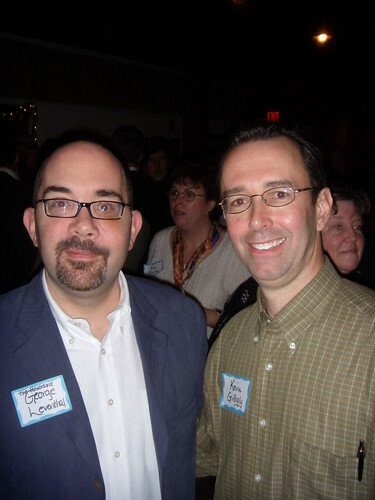 George Leventhal and blogger Kevin Gillogly (of Maryland Politics Watch) pose for a picture at Tom Hucker's fundraiser last Sunday at McGinty's. Check out Kevin's (less gossipy) post about the event right here. With nearly three years left until the next election, State Delegate Tom Hucker (D-Dist. 20) kicked off his re-election campaign early with a fundraiser held last Sunday at McGinty's Public House in Downtown Silver Spring. Hucker entertained hundreds of well-wishers - some paying as much as $1,000 to get in - who came to see Governor Martin O'Malley, fresh from campaigning for Hillary Clinton in New Hampshire. "You gotta build all the time," says O'Malley, being handed a glass of Guinness by an aide. "The election is in three years, and you gotta keep going. It makes [Hucker] stronger as a delegate and more formidable in the election." Curious mallgoers peered into the packed room from inside City Place as MoCo's movers-and-shakers worked the crowd. Despite nerve damage from a car accident last year that has rendered him unable to smile, Councilman George Leventhal (D-At Large) came out to support the delegate. Upon arrival, County Executive Ike Leggett and his wife, Catherine, were gently heckled outside the bar by a group of anti-ICC protestors holding signs. And Councilwoman Duchy Trachtenberg (D-At Large) - currently taking the heat for some irresponsible Internet use - gave JUTP the cold shoulder when we offered a friendly "hello." One attendee that may have raised a few eyebrows was Audrey Schaefer, spokeswoman for I.M.P. Productions and Seth Hurwitz, owner of the 9:30 Club. Schaefer and Hurwitz are currently challenging Montgomery County's choice of Live Nation as operator for a proposed music club in the J.C. Penney Building on Colesville Road. The venue would be located in Hucker's district, which stretches from Takoma Park to Colesville. what's going on here? so much more AFTER THE JUMP . 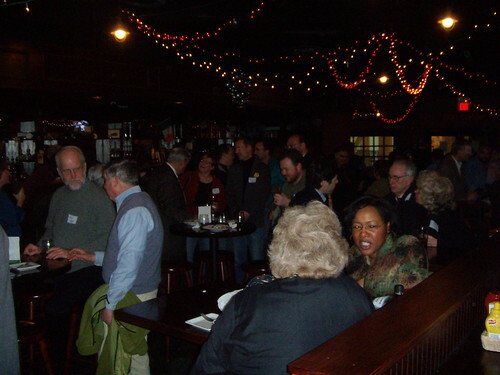 . .
Over two hundred people packed McGinty's for Tom Hucker's campaign fundraiser last Sunday. In an e-mail to JUTP, Hucker explained that he knows Schaefer by her lobbying for other issues in Annapolis. "I haven't seen any details in writing yet about the Live Nation proposal, besides what has been reported in the media," the delegate writes. "I'm hoping to receive more information and help find the best fit for that site and the best deal for Silver Spring." The former president of Progressive Maryland, an advocacy group for working families, Hucker has strong credentials with the progressive community. "He's a great guy and he enjoys what he does," says Linda Harvey, who worked with Hucker while at Progressive Maryland. "He loves people, especially people who are underprivileged. He doesn't just believe in giving them a fish - but teaching them to fish." While in line to speak with Governor O'Malley, youth advocate Rex Smith explained why he's offering his support. "I think he's a guy who's very progressive about dealing with troubled kids," says Smith, president of Hearts and Homes for Youth, which runs a number of group homes throughout Montgomery County. "He's someone who's willing to put our money where our mouth is in dealing with kids." Takoma Park resident Bob Bingaman attended the event with his son Kevin. At the bar, Bob explained why he was also supporting the freshman delegate. "I just feel like he's a good progressive," says Bingaman, national field director for the Sierra Club. "I've worked for an environmental agency and I feel like he's just one of us." But, of course, there were other draws to the Delegate's fundraiser. When asked if he'd just tagged along for the free food and drink, Kevin - who'd just pounded down a glass of something, we're not quite sure - politely smiled and nodded. Personally, I am more comfortable behind the camera than in front of it. Look at my profile pix. You did a nice job of covering the event. Thanks for the shout out.